This 2-part article, looks at the way digital marketing is impacting our world. It compares the creative crafts of 60s, 70s and 80s advertising with contemporary award-winners. It questions whether today’s trend towards maximising visual impact and minimising the written word really makes sense. And finally, it attempts to answer the question: has the medium now become more important than the message? Hanging on the wall of my study is a Musketoon. Like a Blunderbuss on steroids, it’s a brutal relic of Britain’s violent past. Two centuries ago, at the battle of Trafalgar, this same weapon had been carried high into the rigging of Nelson’s flagship to rake and flense the enemy’s exposed deck. Back then, Britain’s consumers were divided into six arbitrary rankings: A, B, C1, C2, D and E. In a nation still obsessed with ‘white and blue collar’ class divisions everyone was simplistically defined by their social status and disposable income. Media choice was just as limited. You could take your pick from newspapers (national, regional and local), colour supplements, popular magazines, specialist press, TV, cinema, poster sites, tube cards, bus sides and – well – that was about it. Commercial radio only arrived in 1973 and we had to wait another twenty years for the online revolution of internet and social media. Technology has totally transformed marketing. In the last two years alone, we have created more data than in the entire history of the human race. Companies can now profile their markets and customers with a precision that would alarm most people. Our lives, lifestyles, work choices, finances, habits, behaviours, interests, passions and relationships are known in intimate detail. And we obligingly provide much of this detail by sharing the minutiae of our lives on Facebook and Twitter. Savvy marketing directors have certainly not been slow to capitalise on these insights. And the power at their disposal is truly awesome. For example, in the B2B sector, just imagine you could continuously monitor every company in the British economy. You could identify and prioritise target companies with a genuine need for your services. You could filter each prospect by sector, financial performance, growth direction and recent sales triggers. And you could do all of this in real time to bring instant forensic intelligence, certainty and scalability to your marketing. Actually, this isn’t an imaginary wish-list. This remarkable service really does exist. The team delivering it has just joined our Clustre innovation community. It has transformed the way we analyse consumer behaviours, extrapolate data as well as communicate and build relationships with customers. Neuromarketing can now take us deep inside the customer’s psyche… probing the brain to understand people’s sensory, cognitive and affective responses to marketing stimuli. Remarketing keeps us front-of-mind at every mouse-click in a consumer’s travels. And, if people ever tear themselves away from the internet screen, personally targeted proximity marketing prompts them to buy with every in-store step they take. But, believe me, we are barely scratching the surface. Artificial Intelligence (AI) promises to be the biggest game-changer to ever hit marketing. Working very closely with a leading AI innovator, I have glimpsed that future and it will undoubtedly take the science of customer relations to an entirely new dimension of sophistication. It’s all very exciting. But is technology really improving the quality of modern marketing? It’s a question that troubles me. Talking to many marketing executives they often appear to be more animated about the medium than the message. Like the dodgy steering on a MOT failure, their conversation keeps veering towards the cleverness of their digital channels rather than the supremacy of their ideas. Has marketing now become a triumph of technology over creative persuasion? In the late 50s and early 60s, refrigerators were still a luxury purchase so food hygiene was a serious concern. 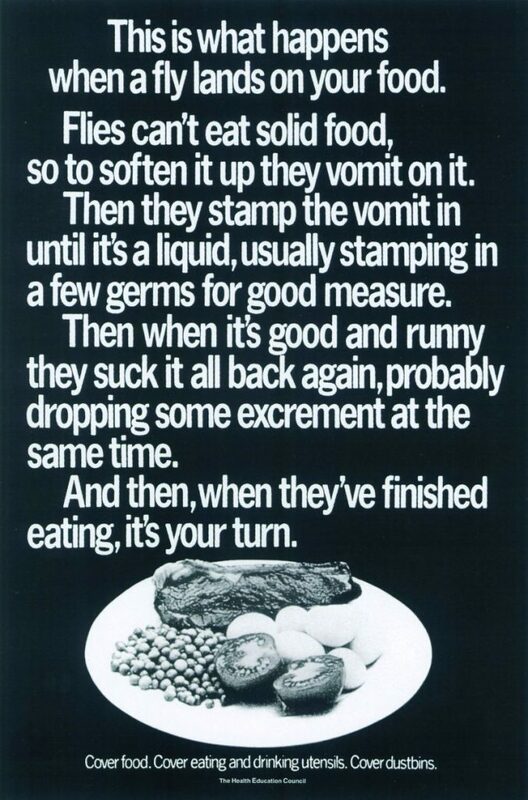 Searching through the archives of a government department, Saatchi stumbled on a dusty academic paper on the subject of food contamination. He used it to craft one of the most unpleasant, powerful and persuasive public health posters ever written. God, how I wish I had written it! 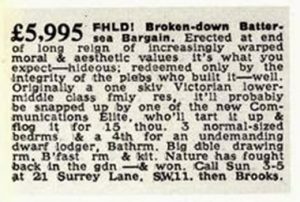 It’s what you expect – hideous; redeemed only by the integrity of the plebs who built it – well. 3 normal-sized bedrms & a 4th for an undemanding dwarf lodger. Nature has fought back in the gdn – & won. Quirky, candid and wickedly funny, these advertisements became cult viewing. Thousands of people would buy the Sunday paper just to read his advertisements. And they worked. These tiny classified advertisements sold many hundreds of homes and, in the process, made Brooks a multi-millionaire. Who dares wins. The Economist is arguably the most beautifully conceived and exquisitely crafted poster campaign this country has ever seen. 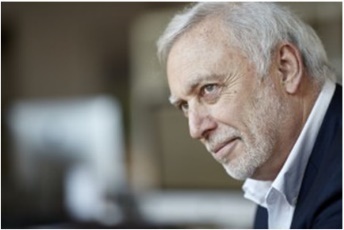 Created by the late David Abbott – legendary creative head of Abbott Mead Vickers BBDO agency – it is witty, confident, erudite and intellectually stimulating. In short, everything you would expect to find between the covers of the Economist. Ever wondered how the snowplough driver drives to the snowplough? This one drives a Volkswagen. Those 15 words tell you everything you need to know about this incredible little car. It’s robust… reliable… rugged… durable… unfailing… and utterly dependable. These sentiments built the bedrock of VW’s brand reputation and cemented the beetles’ plucky charm in the American consciousness. And when you watch the commercial today, its brand values shine through just as brightly as they did in the 60s. Fast-forward fifty years, I just wonder how many of today’s commercials will shine as brightly? The primitive ritual of peeling, boiling and mashing the humble spud reduces the Martians to side-splitting laughter. And we laugh with them. It’s a contagiously funny commercial that stamps the Smash brand indelibly on our memories as we share the humour. A brilliant, witty idea that has stood the test of time. But can you say the same for most of today’s commercials? Good advertising begins with a great idea. First, a great idea has to be distinctive. There’s no mileage in parody. Second, a great idea has to connect with the right consumers. Indeed, really exceptional ideas also entertain, amuse, fascinate, delight and touch the soul in equal measure. Third – and perhaps this should have been my first priority – great ideas should be vehicles for demonstrating a brand’s inherent qualities and strengths. 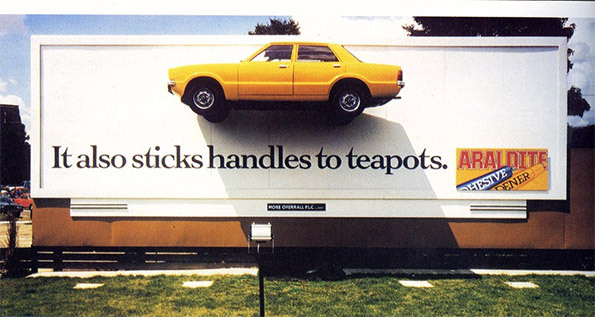 Araldite took this message literally and glued cars to giant billboards. Unmissable and utterly memorable they also stuck the Araldite brand firmly front-of-mind. Fourth – great ideas inform and instil passionate loyalty. Again, let me explain by example: In 1977, Steve Jobs recruited Mike Markkula, to prepare a business plan for his nascent company. Markkula produced a simple, single-page route map: The Apple Marketing Philosophy. It contains three guiding principles and the first priority is Customer Empathy: “We will truly understand their needs better than any other company.” That imperative is not only evident in Apple’s product range, it is still core to the company’s ethos. Because when a company is passionate about its values and products, it breeds equally passionate customer advocates. Put it like this, have you ever met an Apple user who doesn’t have an evangelical desire to convert you? Fifth – and finally – a great idea should have legs. An enduring ability to keep re-inventing itself whilst remaining faithful to its innate brand values. We believe in difference. Because it makes a difference. If you surprise people, then they’ll sit up. If you speak a different language from everyone else, then they’ll listen. If you craft your message with love and originality, then that message will land harder. If you give people something useful that makes their lives a little bit better, then they’ll thank you. And if you get all of this right, well, that’s how brands are built. The second part of this article will look at the rise of social media…it will focus on some outstanding digital campaigns… it will study the rise of niche specialists and their impact on transmedia marketing… and it will question whether advertising is abandoning some of its vital creative skills… is it too arrogant for its own good?